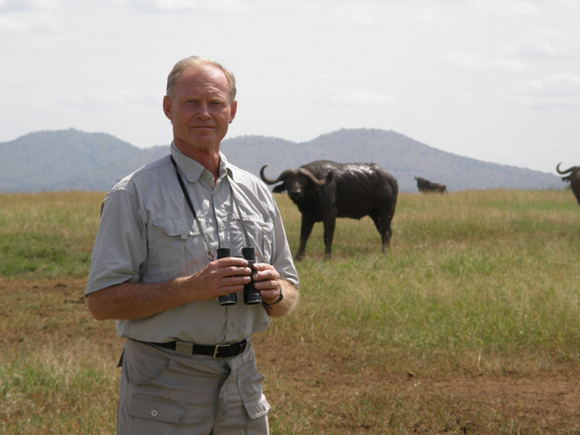 Anthony Sinclair discusses the science behind life on the Serengeti at the Rotary Centre for the Arts, Monday, May 13, at 7:30 p.m. The event is part of the Canadian Society for Ecology and Evolution conference taking place at UBC’s Okanagan campus, May 13 to 15. The Okanagan’s fauna, flora, and natural beauty will be on full display when UBC’s Okanagan campus hosts 400 scientists during next week’s conference for the Canadian Society for Ecology and Evolution (CSEE). The eighth-annual event, taking place May 12 to 15, attracts ecologists and evolutionary biologists from around the world, says Jason Pither, assistant professor of biology and physical geography at UBC. The Okanagan, he notes, is the perfect backdrop for a conference of this kind, especially since it represents one of Canada's biodiversity hotspots and is home to many endangered species. Membership in the Canadian Society for Ecology and Evolution is not just reserved for academics, he notes. CSEE members include scientists from industry, government, and non-governmental organizations. And the topics can be of global significance, such as the ecological and evolutionary impacts of climate change, and, more specific to our region, the effect of the Mountain Pine Beetle on western forest ecosystems. The CSEE encourages student involvement in the annual meetings, and provides award funding for best student presentations. Pither says UBC is well represented at this year's meeting, with more than 20 graduate and undergraduate students presenting their latest research. The scientific program also includes nine organized symposia, some with a specific focus on policy. One symposium tackles hot-button current events with lawyers, policy makers, media analysts, and seasoned scientists discussing the growing barriers to getting good science into the hands of politicians. Keynote speakers include Pierre Legendre, biology professor at the University of Montreal, who will receive the CSEE Presidents’ Award for his extensive contributions to advancing ecology and evolutionary biology research. Fred Allendorf, Regents Professor Emeritus at the University of Montana, and a world-renowned authority on population genetics and conservation biology, will address the conference theme Range margins in a rapidly changing world. The CSEE has two public events. On Saturday, May 11, children are encouraged to come to the Environmental Education Centre for the Okanagan (EECO) and participate in a nature walk. Organized by UBC graduate students, the walk includes tips to identify birds by their song, an introduction to mushrooms, and a trip to the turtle pond with a local reptile expert. Pither notes that while the nature walk is aimed at elementary school students, people of all ages are welcome. The EECO is located at Mission Creek Regional Park on Springfield Road, Kelowna. The nature walk begins at 9 a.m. The May 13 public event features Anthony Sinclair, professor emeritus at UBC's Department of Zoology in Vancouver, who will unveil the story behind the science of Africa’s Serengeti. Sinclair has spent more than 50 years in Tanzania where he has studied the cycle of wildlife through years of drought and starvation, the role of predators and disease, and the reasons behind the migration of specific species. Sinclair’s talk takes place in the Mary Irwin Theatre at the Rotary Centre for the Arts, 421 Cawston Ave., Kelowna, on Monday, May 13, at 7:30 p.m. This public event is free. However, registration is encouraged at www.sinclairtalk.eventbrite.ca. SCEE conference participants will also have opportunities to enjoy the natural beauty of the Southern Interior. Organized field trips include visits to the South Okanagan Desert and Saline Lakes, Lac du Bois Provincial Park, and Okanagan Mountain Provincial Park, to explore the rebirth of the flora after the 2003 fires. While much of the week’s highlights cater to conference delegates, Pither notes that the public is welcome to attend the keynote seminars. Legendre speaks at UBC on Tuesday, May 14, at 1:15 p.m., and Allendorf speaks on Wednesday, May 15, at 8 a.m. Both keynote events take place in Room 130 of the Arts and Sciences Centre, 3187 University Way in Kelowna.